I have 2 VHD mounted on my server. I know where one of the actual VHDs is stored. But I have no clue as to where the second one is physically located. There must be way to find the actual location of a VHD on the local computer or network using the standard Windows GUI, powershell, cmd or Registry. Does anybody know how to get this value? 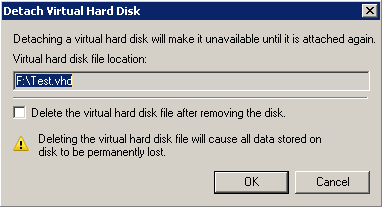 I couldn't find any easy way to do it; even the Disk Management console will not show you the physical path of the VHD when checking its properties. The diskpart command can show the path of mounted VHDs. Run the following commands in a command prompt or PowerShell. Not the answer you're looking for? Browse other questions tagged windows-server-2008-r2 vhd or ask your own question. Do I create a fixed size or expandable VHD if I know the contents size in advance? Possible to get a listing of all folder permissions/access on Windows Server 2008 R2? Azure - Disk Snapshots accumulating and costing. Where do they come from?